Very little is known about the artist of Winter in Holland: even his name is not beyond doubt. Despite a signature that looks like ‘Boyer', research indicates that the artist is most likely to be J Bayer (1840-1893), a German painter who studied in Cologne and later moved to Rotterdam. 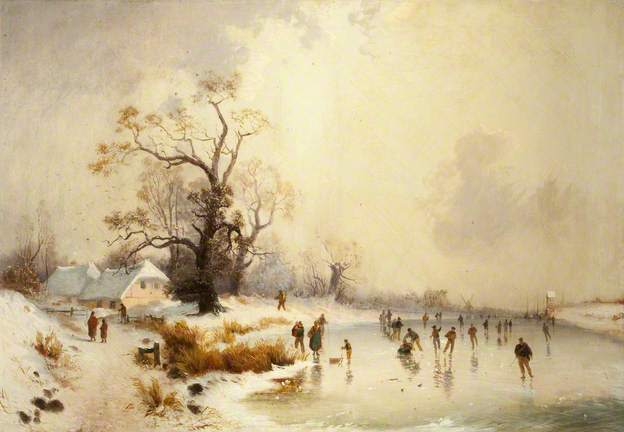 (1) Although less impressionistic in its details, another painting of a Dutch Winter Scene, known to be by J Bayer, shows signs of being by the same artist: the trees and the shoreline details, together with a similarity in the skating figures, support this attribution. (2) He appears to have been influenced by Nicolaas Roosenboom (1805-1880) who specialised in winter landscapes. The composition of Winter in Holland is very pleasing, with an approximate one-third, two-thirds split both vertically and horizontally. The sky reflects the monochrome of winter but with a suggestion of warmth in the yellows. Given the remnants of leaves on the trees it is probably early winter. The ice looks barely frozen enough for skating. There is very relaxed movement in the painting with no evidence of a stiff wind despite the clouds. There are no frenetic skaters or indeed much skating at all. The cottages are in a distinctive Dutch style, low with fairly steep roof caps and a pitched roof on the gable end. The effect of the undefined clouds and the sketchy figures is very impressionistic.